Some good news for the AMD miners that want to mine SpreadCoin (SPR), there is a new fork of sgminer by girino (source) that increases significantly the performance for AMD OpenCL miners. We have compiled a windows binary from the source and on our test AMD Radeon R9 280X we’ve managed to get about 1.9 MHS with the new miner without overclocking the GPU. Increasing the intensity f the miner further than 20 could also help you get some more hashrate out of the GPU, do note however that this is a development version and it may not be very stable or problem free. While not quite as fast as Nvidia GPUs for mining SpreadCoin this is a good improvement over the previously available OpenCL miner. Have in mind that SpreadCoin (SPR) needs to be solo mined as it does not support pools, so you need to setup your wallet for solo mining and need to connect the miner to the wallet. This means no shares and you will know only when you find a block and that may take a while, depending on your luck, as the SPR difficulty is already quite high. Still, as we’ve got a request for a windows binary of the above OpenCL miner for AMD, you can download it from the link below and try what hashrate you will get with this performance improved miner. 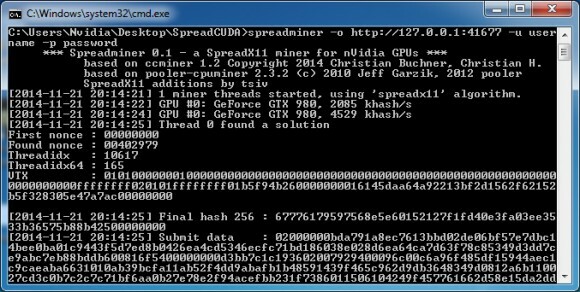 SpreadCoin (SPR) is not a new coin, but it was a mine-able only with CPU up until yesterday when an AMD GPU miner was released and today the coin also got an Nvidia GPU miner that is apparently much faster than the AMD one. 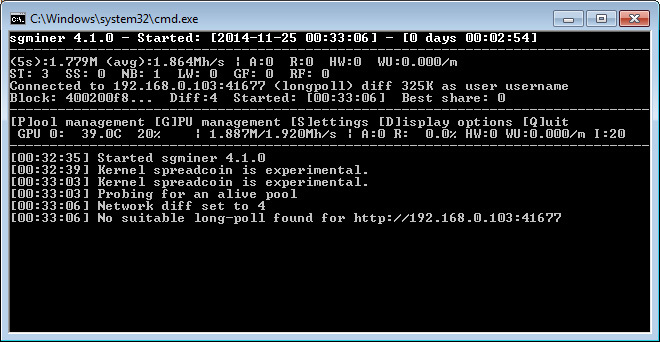 The AMD OpenCL miner is available on the official SpreadCoin GitHub page (source) and there is a compiled windows binary available on the official coin website. You can get the spreadminer for Nvidia GPUs thanks to tsiv who created it (source), there is an official windows binary release for Compute 3.0 to 5.2 GPUs available on his GitHub page as well that you can download and use directly. For the moment you would probably want to try out the coin if you have an Nvidia GPUs as they are performing much better in terms of hashrate than what you can get on AMD GPUs. On a stock Radeon R9 280X we managed to get just about 800 KHS using the official OpenCL miner and with the Nvidia CUDA miner on a GTX 750 Ti card we easily got over 1400 KHS, trying it out on a GTX 980 we’ve managed to squeeze close to 4500 KHS. So if you have some Nvidia GPUs, especially Maxwell-based cards you might want to mine some SpreadCoins while the difficulty is not way too high to be worth mining with one or just a few cards. Also do not forget that with solo mining luck plays an important role as well and you might get lucky and find more blocks in short time or not and wait more for little blocks, so give the miners some time.